It can be frightening to learn that you have macular edema. This condition is when the macula, which is the part of the eye in the middle of the retina, becomes filled with fluid. It can cause blurry, confused vision, distortion of color perception, and other symptoms. 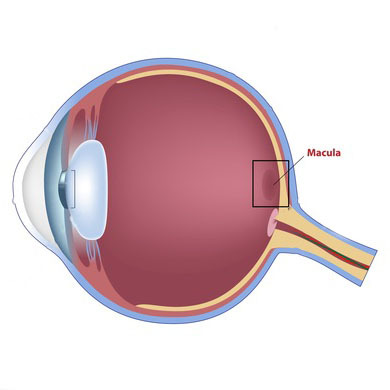 The macula is the part of the eye that controls how you see right in front of you and how you discern sharp, strong light. For this reason, macular edema can upset the way you see and perceive light. Luckily, there are several treatments available. Some require in-office treatments, while others involve a simple regime at home. Although it is not a pleasant thing to experience, macular edema is curable. What are the causes of macular edema? The buildup of fluid happens when blood vessels get injured and drain into the center of your eye. There are a few reasons this happens. It is more common in people with diabetes who often have vision problems. It can also occur after eye surgery or simply as a result of vision deterioration as you get older. Diabetic retinopathy is very common in diabetics. It causes more people in the United States to go blind than any other illness. It can also lead to macular edema. Erratic blood sugar levels or high blood pressure can exacerbate this condition. These problems with blood sugar and pressure cause strain on the blood vessels in the eyes. This can lead to damage and fluid buildup. Although it can happen at any point, it is more common in advanced stage diabetic retinopathy. Macular edema is not common after eye surgery, but it can happen. Between roughly 1 and 3 percent of people who have surgery on their eyes may develop macular edema. Unfortunately, if you get it in one eye after surgery, you have a 50 percent chance of developing it in your other eye. The good news is that these cases are usually very mild. They are easily treated with anti-inflammatory eye drops. Macular edema after surgery is unlikely to last. As people get older, they may also experience macular edema as their retinas wear out. With some types of age-related macular edema, fluid accumulates from new blood vessels growing under the retina. These then leak into the eye. Like the other types of macular edema, this causes distorted vision and color deterioration. There are also other possible causes of macular edema. These include blocked blood vessels and diseases that cause blood vessel inflammation. Blockages keep blood from draining out of the eye and can cause it to drain into the retina instead. This is usually related to conditions like diabetes, glaucoma, or high blood pressure. Inflammation-causing diseases, meanwhile, are collectively referred to as uveitis. They can cause damage to many parts of the eye, including tissue, nerves, retinas, and more. Uveitis conditions include toxoplasmosis, Eales disease, and retinal necrosis, among others. What will my doctor do to find out if I have macular edema? It is always a smart idea to make an appointment with your eye doctor if you notice new visual disturbances. To find out if you have macular edema, your eye care professional may run several tests. You will be familiar with many of them from your regular annual eye exams. Your doctor will probably ask you to take a visual acuity test. This involves reading a chart of letters with one eye covered. This tests the extent of your vision loss. You may also do one of several other vision tests. He or she might also dilate your eyes so that your retina is more visible for examination. The doctor can use simple eye drops to dilate your eyes. If your doctor suspects you have macular edema after these initial tests, he or she may conduct a fluorescein angiogram. This involves a small injection of dye into your arm. Your doctor will observe its passage through the blood vessels in your eye to see the extent of the damage. Your doctor also might opt to do a test called optical coherence tomography. This uses a camera to examine your retinal layers to know how swollen or inflamed they are. What are the treatments for macular edema? If your doctor diagnoses you with macular edema, there are several different treatments. Some of them depend on the type of macular edema you have. Your retinal damage may be the result of underlying health conditions like high blood pressure or diabetes. If so, your doctor may want to focus on treating those conditions first to decrease the pressure on your blood vessels. After that, you can turn your attention to healing the deterioration in your vision. Most standard treatments involve a quick injection. Your eyes will be numbed, and then your doctor will use a very small needle to inject medicine into your eyes. This medicine blocks the growth of blood vessels. Some forms of macular edema require the use of anti-inflammatory steroids as treatment. These might be administered orally in pill form, as eye drops, or as injections. These are the usual treatments for macular edema caused by any form of uveitis. Surgery-induced macular edema, meanwhile, is usually treated with nonsteroidal eye drops. Occasionally, macular edema can need a minor outpatient surgery called a vitrectomy. This is only for cases caused by the vitreous (the gel inside the eye) tugs on the macula, distorting vision. However, a vitrectomy is not required for most forms of macular edema. Vision changes are not something that anyone wants to deal with, but unfortunately, they are sometimes a simple fact of life. They may happen as a result of an underlying condition — or they might just happen naturally as you grow older and your eyes get strained. Although it is always alarming to learn that you have an eye disease, doctors at the New Jersey Eye Center in Bergenfield or Passaic, NJ, can offer help. Their compassionate care and expertise make them the perfect choice for reliable care of macular edema.